Northern Tablelands MP Adam Marshall with Moree Homes for the Aged Reserve Trust President Lorraine Bartel, left, Secretary Jay McNamara and Treasurer Kaye Bverger. 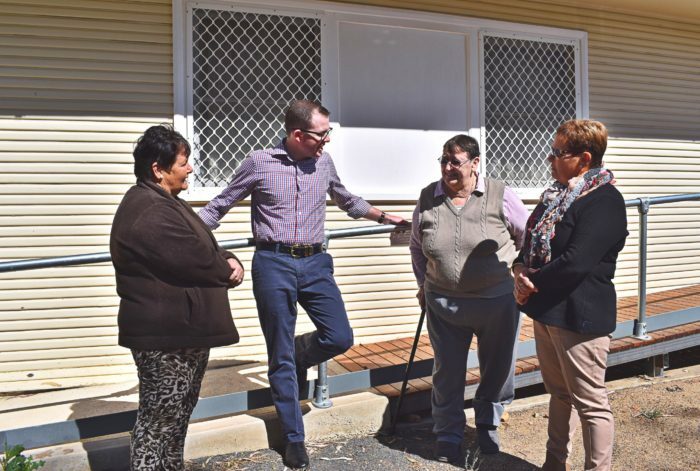 THE residents of Moree’s Moreena Units, many of them elderly and with disabilities, will have improved access to their homes when two new access ramps are constructed shortly, using funds from a $20,000 grant from the NSW Government. Northern Tablelands MP Adam Marshall visited the Moreena Units late last week to announce the good news and said it was gratifying to see the board of Trustees working so diligently to improve the quality of life of its residents. “The Moreena Units provide an essential housing service in Moree, giving older people with limited means, a comfortable and friendly lodging place,” Mr Marshall said. “Over the past few years, the Trustees have been working towards replacing the dilapidated and non-compliant access ramps throughout the entire complex. They have been doing an amazing job on a very tight budget so this funding is a very welcome boost. Mr Marshall said this year the Northern Tablelands had secured $1.12 million from the government’s Public Reserve Management Fund (PRMF) for projects across the region. “It’s an unprecedented amount for our region’s public reserves and I know it will all be put to very good use to improve community spaces and facilities,” he said. Mr Marshall said $94 million had been invested in NSW reserves trusts over the last six years to upgrade of showgrounds, the maintain community buildings, bushfire hazard reduction, weed control and building new infrastructure.